Beer #267 is another first for me…a gluten free beer. 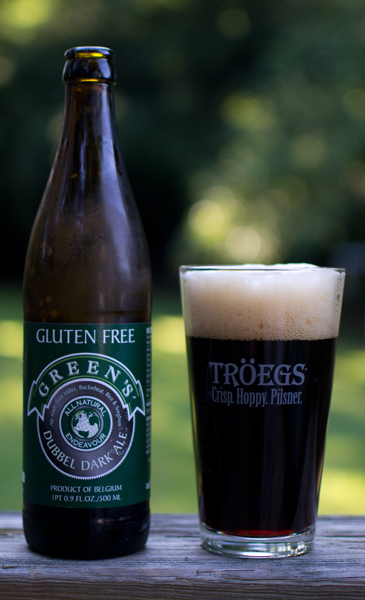 Green’s Dubbel Dark Ale by DeProef Brouwerij from Belgium is a beer that DOES NOT contain wheat, barley, peanuts, crustaceans, eggs, fish, soy beans, milk, lactose, nuts, celery, mustard, sesame seeds, sulfur dioxide, or sulfites. OK…what does this Dubbel with an ABV of 7% contain? Why it is an ale brewed with millet, buckwheat, rice, sorghum, hops, & yeast. This is also one of the few beers I have seen that has the calorie content on it…and that is 118 calories per serving of which there are two. Why am I getting a bad feeling about this? Into my pint glass it went with a dark brown color with a very large and frothy tan head. The nose was sweet with a hint of dark fruits. A brown sugar sweetness hit me first in the taste with a tiny amount of roasted malts. To be honest it tasted…odd and it had a funky, almost tart aftertaste. It was quite thin body wise with some decent stinging carbonation. It was not drinkable at all. I didn’t even finish a serving…and dumped the 2nd. This wasn’t wasn’t good at all…yuck. Gluten free…not for me. This is another first for me in that today I will be having my first Dubbel. What is a Dubbel? Was it tasty? Did I care to have another? Read on to find out. 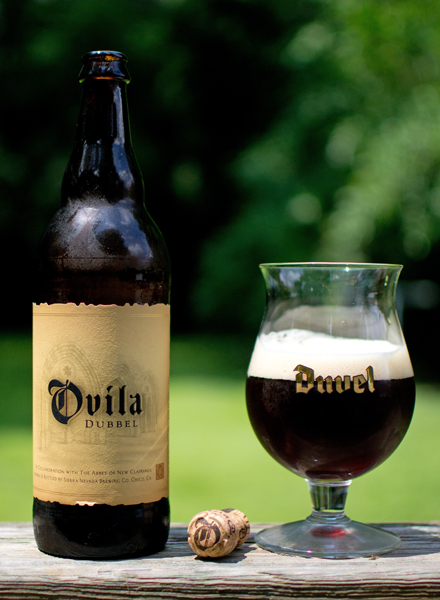 Beer #201 is Ovila Dubbel by Sierra Nevada Brewing Company. Sierra Nevada is from Chico, California. They brewed this Dubbel (ABV of 7.5%) in collaboration with The Abbey Of New Clairvaux, a Trappist monestary located in northern California. A Dubbel is a malty Belgian brew typically brewed by Trappist monks. Into my Duvel tulip glass I poured this. It had an opaque brown color with a very nice frothy head. I dipped my nose into the glass and got fruits and spices. Apple was the primary fruit with a light peppery aroma. The taste was a bit of a dissapointment. It wasn’t as fruity as the nose suggested. It had more of a sweet caramel malty taste with those familiar spicy Belgian yeast flavors. It also had a brown sugar like taste. It was much lighter in the body than the appearance led me to believe. It was kind if watery with low carbonation making this sort of smooth. The alcohol was hidden nicely. It took me a while to drink this for some reason…and no…I didn’t want another. This was a nice beer that kind of took a wrong turn in the taste department for me…I just thought the taste didn’t live up to the nose. Being it was my first Dubbel, maybe this is how they typically are? I will have to get some more Dubbels to compare this too in the future.